A man has died after a fatal collision with a lorry at the Peterborough Service Station at Haddon. Police, ambulance and fire services are currently at the scene. The collision involved a HGV and the man. The A605 is open, however HGVs are not able to access the service station and are advised to avoid the area. Police were called at 1.49pm. A spokesman for the East of England Ambulance Service said; “We were called at 1.40pm to Peterborough Services Truck Pumps, Peterborough Road, Haddon, to a road traffic collision. “An ambulance, rapid response vehicle, ambulance officer and the Magpas air ambulance attended the scene along with police and fire crews. 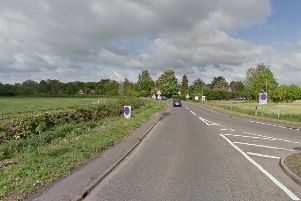 The collision involved a lorry and a man. Anyone who witnessed the collision should contact the Road Policing Unit on 101 quoting CC-12122017-0236.